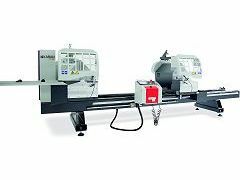 Kaban AC1050 servo control double mitre saw for aluminium. Can be used for uPVC also. Blades 550mm. Fully automatic and cut any angles automatically without any manual adjustments. It cuts 25 degree to 135 degree automatically. V cutting for mullion can be done automatically. Loan facility also available. Recommend to watch the video on YouTube.